One of the common misconceptions about chiropractic treatment is that it’s all about the spine and treating for back pain. The fact is that chiropractic can achieve results for all kinds of conditions – from top to toe. Here at Mind & Body we take a holistic approach to getting you well and keeping you well. We treat the whole person not just the symptoms. Recently, we have been seeing more and more people with severe pain in the soles of their feet. 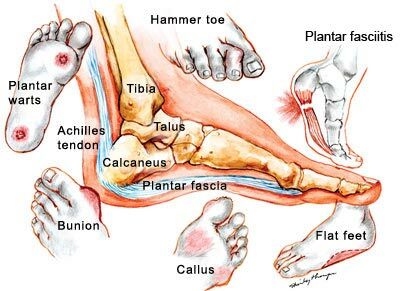 In most cases, this is the condition known as plantar fasciitis. This can be extremely painful and in some cases the patient can hardly walk. Staying on your feet all day is almost unbearable. If you are suffering from plantar fasciitis, you know how bad it can be. The good news is that chiropractic adjustments, combined with proper footwear and simple exercises, can make the pain go away and not come back. My friend, Steve Marshall, the local podiatrist will tell you, the first thing is to get into appropriate footwear and half the problems disappear. As for the pain you’re currently experiencing, we can definitely treat that. The foot is a very complex structure and the small joints of the feet all have to be mobilized for the joint action to occur. If any of these joints get stuck they become very painful. So we begin by examining the various movements of the mechanism like the talus and the calcaneus on the mid-foot and the fore-foot and so on. And if you can restore the movements of those joints, you can take the pressure off the ligaments and the fascia and in most cases, this will alleviate the pain. The ankle bone’s connected to the leg bone! On a serious note, if you have problem feet, a visit to a good chiropractor is an excellent place to put you on the path to recovery. At Mind & Body Chiropractic, we are so confident of our ability to sort out this sort of problem, that we offer a guarantee. If you don’t feel an improvement after 3 treatments, we give you your money back. Get in touch with the office and we can get you back on your feet.